Liam Riecks became the Titans first 3-time District medal winner since Tyree Sutton in 2015. 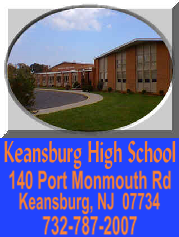 It is the 9th season in a row with a medal winner for Keansburg. The Titans have a strong group returning from last season and should feature a lineup littered with experience up and down. The big gun returning for Keansburg is senior Liam Riecks. The senior is a 2-time District medal winner, with 55 career wins, that will anchor the upper portion of the lineup that will be where the Titans are breaking in the majority of their new faces. Among those new faces competing for varsity time in the 182-Hwt range are a group of frosh that includes promising newcomers Glenn Pitius and Keyshaun CoppingerWard. The deepest part of the lineup lies in the 138-170 range. Patrick Edwards, Elijah Moore, Yaseen Zaky, and Isiah Stanton are all returning starters from a year ago, and Josh Celia rejoins the lineup after starting in 2017. There are good numbers behind them, including promising freshman Michael Moro. Down low, from 106-132, the numbers are a bit thin, but Shea Hoff, Gavyn Read, Jesse Berescky, and Kobi Ferrer are all returning starters with double digit wins in 2018. So while it might not be the deepest group, it is a foursome capable of racking up the wins this year for KBurg. With just about everyone from last season's team back, the Titans will look to take a step forward in 2019. They look to improve upon last year's record and be competitive in the division and sectional races. As long the team stays healthy, there's no reason to think the Titans won't take a step forward this season. The Titans are the only team besides Pt Beach and Shore to win the B-Central Title.